50 people were killed and 53 more were injured in an Orlando nightclub. People in DFW are mourning the losses in every way possible. There will be a vigil held Sunday night in honor of the lives taken. In light of the shooting that claimed the lives of 49 and wounded more than 50 in Orlando, Florida, local residents in DFW are mourning and honoring those who lost their lives anyway that they can. The massacre, which the FBI is investigating as a terrorist attack, is the deadliest mass shooting in United States history. Early Sunday morning, a gunman wielding an AR-15 rifle and handgun went into the gay club, Pulse, in Orlando, where he opened fire more than 100 times, NBC News reports. The suspect, Omar Mateen, died after being shot by SWAT officers. In the wake of this massacre, people across North Texas are remembering those who lost their lives, leaving flowers at the Legacy of Love monument, a LGBT landmark in Oak Lawn. “Being that we’re in Dallas, this statue is probably one of the closest and nearest things to us that we can represent our sign of love and show that we are there for them even though we are a great distance away,” said DFW resident, Trent Brown. Jonathan Davis, another monument visitor, described feeling “shock and disbelief” after hearing the news of the attacks. “You hear the number of people and part of you wants to believe it, the other part of you is just instantly mourning these victims,” Davis said. Almost two years ago, that same LGBT landmark was vandalized with “666,” the biblical sign of the devil, along with surrounding buildings. A vigil was held in Oak Lawn Sunday at 8 p.m. to honor those whose lives were taken Sunday morning. Hundreds of people went to honor the victims of the tragedy in Florida and gather around the LGBT community in the Resource Center off Cedar Springs Road in Dallas. One LGBT activist, Patti Fink, exclaimed, "Let's be together. Let's be together tonight. Let's be together tomorrow and going forward and let's be one with Orlando. We are all Pulse"
The event began with a press conference hosted by the Dallas Resource Center and the Council on American-Islamic Relations to condemn the the Orlando shooting. 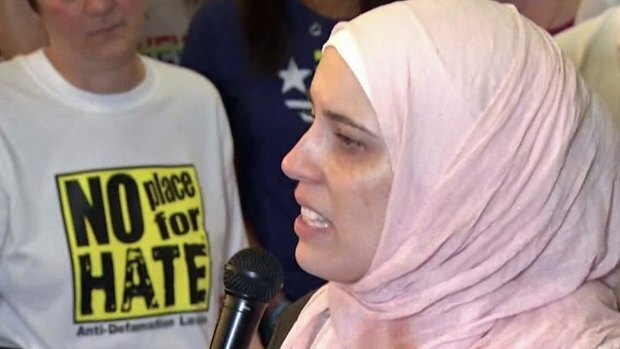 Alia Salem of CAIR said "There is a rainbow and a silver lining we can take away, that this is a chance for us to spit in the face of those criminals who seek to take our joy"
After the press conference and vigil, the group walked in solidarity and remembrance of the victims. While there was a moment of silence during the vigil, people, expressed their anger and distress about the shooting. A vigil was held in Oak Lawn Sunday at 8 p.m. to honor those whose lives were taken Sunday morning. One woman said, "My heart broke. I wanted to crawl into a small space because I'm part of several communities that are always attacked. The black community, im a woman, im queer. Every time I look around violence is coming at me. it would be easy to taint my vision of the world because around every corner I'm thinking some kind of attack is coming at me, But you cannot let that define who we are and. this is who we are." "We stand together. We love you. We will be with you tonight. We will be with you tomorrow, and we will be with you as partners and as friends," said Dallas Police chief David Brown. The mayor of Fort Worth, Betsy Price, released a statement Sunday regarding the shooting. On June 14 at 7 p.m., the world-renowned Turtle Creek Chorale will be hosting a free concert at Cathedral of Hope to "bring hope and healing" in the wake of the Orlando shooting. The Office of Gov. Greg Abbott sent a notice out that all flags must be lowered to half-staff until June 16 "in memory of the victims in the attack." Controversy came about after Texas Lt. Gov. Dan Patrick tweeted a biblical quote earlier in the morning that said: “Do not be deceived: God cannot be mocked. A man reaps what he sows." Backlash soon followed and Patrick deleted the tweet, saying that it was scheduled Thursday to be published Sunday morning before his office had any knowledge of the Orlando attack. President Obama addressed the nation early Sunday afternoon, saying: "We stand with the people of Orlando who have endured a terrible attack on this city. Although it's still early in the investigation, we know enough to say this is an act of terror and an act of hate." Monday: Baylor Scott & White Medical Center -- Garland 6 a.m. - noon. Wednesday: Trammell Crow Center -- Dallas 10 a.m. - 2 p.m.
Wednesday: Sanmina, 1201 W Crosby Road, Carrollton 10 a.m. - 3 p.m.
NBC 5's Cory Smith contributed to this report.